Digital transformation is the process of creating value, growth, and competitive advantage through new offerings, business models, and business relationships that are data centric and data driven. It’s about changing the way that business gets done. This transformation, as provided by Dell and Intel®, also places IT at the forefront when making strategic business decisions related to redefining business processes and operational efficiencies, shifting work and employee productivity, changing customer relationships, increasing buyer loyalty, and transforming product and service revenue streams. 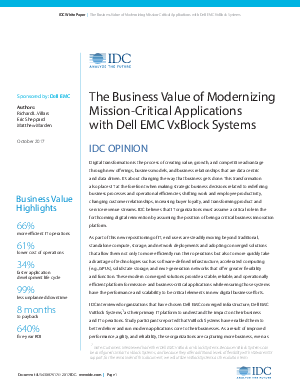 IDC believes that IT organizations must assume a critical role in the forthcoming digital reinvention by assuming the position of being a critical business innovation platform.